Founded by Mike Ashley in 1982 as a single store in Maidenhead, Sports Direct International PLC is today the UK’s largest sporting goods retailer, and operates a diversified portfolio of sports, fitness, fashion and lifestyle brands. Shop the biggest brands at the lowest prices across the widest range of fitness clothing, accessories and training equipment. 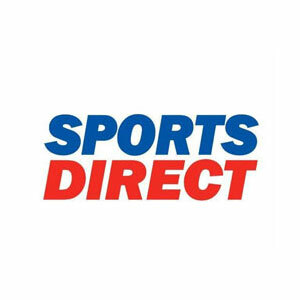 Sports Direct specialise in a number of premium sports brands including Slazenger, Everlast, Lonsdale, Karrimor, Antigua, Carlton, Donnay, USA Pro and more. The company continue to strengthen their leadership with key third party brand partners via the elevation of their sports retail position. In addition to working closely with third party brands, the company maintain a significant portfolio of own brands across Sports, Leisure, Fashion and Lifestyle. Sports Direct brand division operates their globally renowned heritage Group Brands, wholesale, licencing and distribution relationships across the world, as well as partnerships with third party brands that they licence-in to sell in Sports Retail and Premium Lifestyle. The Group owns brands which are managed both individually and centrally within the division. This unique, integrated approach to brand management leverages the expertise of their people, encourages innovation and ensures consistency across all brands. Sports Direct maintain significant investment in their brands to preserve value, and are proud to have a number of high profile sporting and entertainment personalities, as well as international sporting events, and sporting venues as ambassadors for their brands. As a leading European distributor of internationally recognised sports and athleisure brands like Nike, Adidas, Under Armour and Puma, the Groups strategy is to invest in their people and their key third party brand partners in order to elevate their retail proposition to attain new levels of excellence across their multi-channel offering to customers. Sports Direct aspire to be a leading sports and lifestyle retailer internationally and to deliver sustainable growth for shareholders in the medium to long term by offering customers an unrivalled range of high quality leading brands.